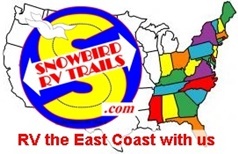 ﻿ "SNOWBIRD RV TRAILS on Mobile"
We travel North to do a little Workamping in the Summertime and South to someplace warm and sunny for the cold months. Trips North and South with different routes and campgrounds each time and set a leisurely pace for getting from here to there. We look for the best routes and best values for our retirement $$$ in campgrounds, restaurants, and sightseeing. We "road-test" some RV gadgets and we review everything with photos, costs and all of the pros and cons. Jack, Niki, K.C. & B.B. Need an RV route, campground or restaurant suggestion? Want help planning the next trip? Would you like more information about Workamping and Free job sources? We invite you to hop aboard for a few miles as we visit new places, find friendly faces and enjoy life along the Snowbird RV Trails. PLANNING IT Tips and sources to find some answers to help plan your next RV trip. ROUTES Our East Coast RV routes, maps, photos and costs for Snowbirds and all RVers. CAMPGROUNDS Economical Parks with local attractions we've visited by State and City. WORKAMPING Our Workamp experiences and free sources for 100's of current Workamping jobs. FRATERNAL The organizations with RV campsites for their members. SNOWBIRD EMAILBAG We invite your question, comment or complaint and we'll throw our 2 cents in. DAILY BLOG When we are on a new RV route or any interesting Day Trips we can share. we love to talk RVing! also on LinkedIn, Tumblr, Twitter and YouTube.